Am I missing something here? Shuttleworth wants to remove Synaptic. Why not just enhance Software Manager and leave Synaptic on the system. Linux is supposed to be all about choice. Seems Shuttleworth is all about what HE wants/deems should be. I moved to LMDE because of his decisions. Hopefully Debian will remain the stallwart version of Linux providing choice. Glad the donation helped! And I’m happy to see you reporting the Linux news again! It’s a pitty you’ll no longer post videos on YouTube as well, but going to a separate website really isn’t much of a hassle. You do a great job. I do not have time to sit two hours to read what’s new in linux so I just watch once a week at your news and have everything I need. For me you are a life saviour so please do not stop. Hi Jordan, I just wanted to drop a note and let you know I am a fan. I am glad you are back on track, I look forward to much more Linux news! By the way, are you attending LinuxCon in Vancouver this August? Glad to be back, my friend! Sadly, no, I won’t be able to make it to LinuxCon. The cost of the trip was extremely prohibitive, and the price to get into LinuxCon itself was as well. Especially now that my Adsense has been canceled. It’s a shame, too, because I would really love to get a chance to meet Linus. Glad to see you back. Screw youtube. They don’t ban users who curse and talk dirty, yet they had to ban thisweekinlinux. That’s ridiculous and even ludicrous. I agree with your stance on not using youtube anymore. I have had problems with AdSense before and they still havent re-activated my account. Good thing Blip.tv has their own ad-revenue program. I enjoy watching your videos and have been for many months. Thank You! and keep up the awesome work. BTW, you video camera is amazing, your videos are amazing quality! Thank you very much! I do have to thank YouTube and Google for the help as far as that’s concerned, because without Adsense and the partnership program, I wouldn’t have been able to afford the newer camera (it’s a Canon T2i with a 50mm f/1.8 lens, by the way). I am one of your big fan. Nice web site and very cool videos ! 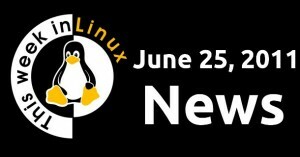 I love linux and this is site is perfect for news about linux ! nice job and luck for you from Brazil ! Hello, I just wanted to say that I just found your blog, about two weeks ago and I love it. I have bookmarked it and watch most of you older posts. I must say its most impressive so than you. Adobe AIR – in UK BBC Iplayer very handy app. I do not have any speakers in my desktop, so I need to download the video to an USB stick and then watch it in my NetBook, but since you moved from YouTube, I can’t download any videos anymore. I have try looking in /.mozilla/firefox/jl3f7wfv.default/Cache But they don’t store there anymore. How can I download videos from this site? Hey, is great to see you back! I have a question… are you a software engineer or something related to it? for my day job, I do a little programming / website design. Great to see you’re back in action. I missed your news for quite a long while. Good luck. You can count me as a loyal follower. Did you remove Ubuntu from MBP? I did. I’ve got Arch and OSX on it now. Sadly, still no broadcom drivers for the wireless chipset, so when I’m in Arch, I have to use a USB dongle for wireless. It’s very nice to see you’re still posting news videos. Unfortunately the blip.tv infrastructure doesn’t seem as polished as that of youtube. I personally do not see why the removal of synaptic from a ‘default install’ is at all that important, it can be easily installed through apt. In general much of the discussion about applications offered in a default install does not make sense to me; well known propetiary systems hardly offer any similar functionality in a default install. Having only one frontend to the debian package manager could seem more reasonable to one newly introduced to linux. I’ll agree, blip.tv’s setup is missing a few key “community” components, like subscribing to channels, but I like their distribution model. I can easily push my videos to Roku boxes and Boxee. Good to have you back Jordan! I’m hoping to be able to watch ALL of your videos via blip, (A.K.A., Bring over the Vlogs too! And make lots of them, I love to hear you ramble ) and hope to enjoy to continue watching one of my favorite and informative internet shows! Good Luck, you have me in the long run. great to see you back, I’ve missed seeing the vids. I’m still trying to figure out the removal of Synaptic. I mean yeah it can be redundant to have the software center and synaptic, but normally the software center doesn’t give you everything snaptic does for searching and getting things, while I have noticed the software center is getting better about that recently in trying to offer similar functions when it comes to search results for things to download. It will be interesting to see more of 11.10 as it gets closer to release.